Q:Can we keep the fish? We encourage Tag and Release, but reasonable size fish can be kept for those onboard, the rest are released. Q:Can we take our fish home? Yes, angler keeps their fish to take home and we will prepare them as you need them. Q:What types of fish are targeted? Q:What are the chances of catching a fish? As with all fishing there is no guarantee but the chances are high as the South China Sea is one of the most productive in the world. The season will start March/April when the winter winds die down and will go through to September/October when the winds return. Q:How far do we go? Q:Can we bring glass bottles or cups? Please do not bring glass. Plastic cups and wine glasses are provided. Q:Are there plates and cutlery on the boat? Q:Is there ice on the boat? Q:What times do we go and return? Q:Do I need to bring fishing rods etc? No all gear is provided, but if you have some you are welcome to bring it. Q:How many people can we take on a charter? Q:Where are the terms and conditions? Q:How do we share the rods on an individual day? Q:Do you go to the Rigs? leave in the morning returning the following evening. Q:Is Kidusi available for beach trips? Yes Kidusi available to charter to the beaches, max 13. It takes only 90 minutes out to Tai Long Wan on the Eastern side of Hong Kong. There are two Kayaks onboard and a number of other beach toys are onboard. You can either swim the short distance to the beach or a dingy can be provided. Start time as you require and return to Aberdeen around 5pm. Makes for a great day out. It is Swahili for “Smells of Fish”. 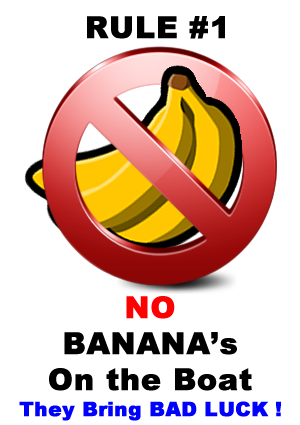 A: Do NOT bring bananas!